Paragon Migrate OS to SSD is a new handy intuitive wizard which is designed to perform quick and safe Windows migrations to new storage devices, typically from hard disk drive (HDD) to SSD. The software provides users an easy, convenient solution to migrate selected folders like OS and program files from a high-capacity HDD to a new speedy, smaller-capacity SSD. 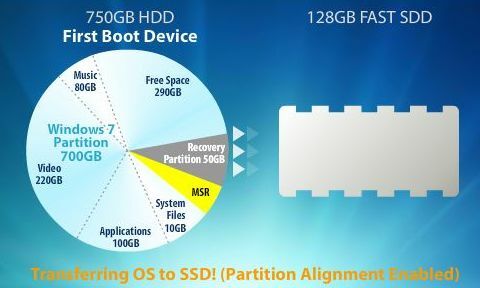 Paragon Migrate OS to SSD normally priced at $19.95 per single license. As part of Paragon Software Group promotion offer, the interested users are now entitled to download the full version of Paragon Migrate OS to SSD for free of charge. To grab a free copy of Paragon Migrate OS to SSD, visit the URL of http://www.paragon-software.com/de/registrierung/mos2ssd.html to fill out the registration form. Shortly, an email (from eservice@paragon-software.com) which contains a product key, license serial code and download URL for the Migrate OS to SSD will be delivered to your registered email ID. Paragon Migrate OS to SSD is compatible with Windows XP, Vista, Server 2008 R2 and Windows 7 platforms.